Concord-Carlisle senior captain David Poor (21) scored a game-high 32 points, and pulled down 11 rebounds to lead the Patriots past the Holliston Panthers in the MIAA D2 Central Sectional Quarterfinals. CONCORD, Mass. - In recent weeks, the Concord-Carlisle Patriots have received outstanding individual performances, including 30 points on eight 3-pointers by senior captain John Mulligan in Concord-Carlisle’s win over Dual County League rival Weston. In the MIAA D2 Central Sectional Quarterfinals against Holliston, it was senior captain David Poor’s turn to have a career night. Poor scored a game-high 32 points and pulled down 11 rebounds to lead the Patriots (16-5) past the Holliston Panthers (15-6) by a score of 82-71 on Thursday night in Concord. Concord-Carlisle head coach David Cohen said that Poor has been carrying Concord-Carlisle on offense throughout the season. “All year, (Poor) is the one that has carried that offense,” Cohen said, adding that when Poor plays well, other teams, just like Holliston did on Thursday, have to double-team and triple-team him, which opens up the floor for other scorers. Poor credited his fellow captains, Spencer Patenaude and John Mulligan, for his success against Holliston. “(Patenaude and Mulligan) were giving me the ball… we worked on getting the ball inside,” Poor said after the game. Poor added that Mulligan’s passes were “perfect.” Mulligan finished with 11 points, 4 boards, and an assist. Patenaude also stuffed the stat sheet on Thursday night, pouring in 20 points and pulling down 11 rebounds. Coach Cohen said that Patenaude’s patience against the Panthers’ defense paid off, and added that Patenaude had to work for everything he got on Thursday night. Patenaude scored four of his team’s first six points, as the two teams traded baskets early in the first quarter. After a jump shot by Holliston captain Andrew Lynch (15 points, 4 rebounds) provided the Panthers with a 9-8 lead, Concord-Carlisle closed the half on an 8-0 run, which included two offensive rebounds and putbacks by Poor and a fadeaway baseline jumper by Mulligan. The Patriots had 16-9 advantage at the end of the first period. Holliston repeatedly fought its way back into the game in the second quarter, as it would do throughout the game. 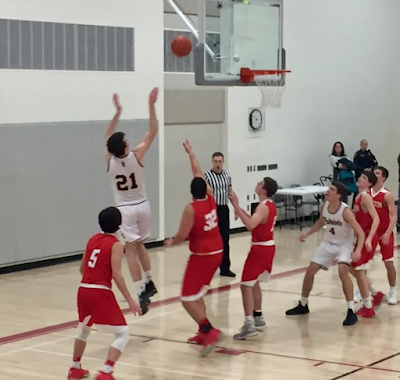 After two free throws by Poor put the Patriots ahead 23-19, the Panthers went on an 8-2 run, which included a jumper by junior Satchel Snow (7 points, 5 rebounds), and a layup by sophomore guard Spencer Aronson, who scored a team-high 20 points. After Aronson’s layup gave Holliston a 27-25 lead, the two teams exchanged baskets for the remainder of the quarter. A rebound and putback by Concord-Carlisle junior Ben Kacher (5 points) diminished the Patriots’ halftime deficit to 33-31. Poor did much of his damage in the third quarter, scoring 14 points in the first 6 minutes and 24 seconds of the third period. Despite Poor’s dominance, the Panthers pulled ahead of the Patriots. A three-pointer by Aronson and baskets by captain Mike Alibrandi (7 points, 8 boards) and senior Mina Shehata gave Holliston a 44-41 lead. Poor scored the next five points of the contest, which included a reverse layup while being fouled. After converting the old-fashioned three-point play, Poor knocked down a turnaround jumper in the paint, giving C-C a 46-44 lead. Poor went to the bench due to foul trouble with 1:36 remaining in the third quarter. Even with Poor out of the game, Concord-Carlisle took a 50-45 lead, courtesy of a basket by Patenaude and a steal and a layup by senior point guard Jack Fell. A layup by Lynch cut the Holliston deficit to 50-47 at the end of the third quarter. Concord-Carlisle looked to put the game away in the fourth quarter, opening the final period on an 8-2 run, which was capped of by a corner three by junior Matt Moreau. Moreau’s shot, which was assisted by Mulligan, provided the Patriots with a 58-51 lead. After Mulligan hit a three-pointer to put the Patriots ahead 61-53, the Panthers went on an 8-2 run, cutting Concord-Carlisle’s advantage to 63-61. Aronson scored four points for the Panthers over that span. The Patriots tried to put the Panthers away again, as Poor scored the next five points of the game with give Concord-Carlisle a 68-63 lead with 2:31 remaining. Holliston junior Dylan Kasarjian (11 points, 11 rebounds) converted an old-fashioned three-point play, cutting the Panthers’ disadvantage to 68-66. Concord-Carlisle responded with a three-pointer by Patenaude and a pair of free throws by Mulligan that put the Patriots ahead 73-66 with 1:10 remaining. Kasarjian made a couple of driving layups to try and will Holliston back into the game, but the experienced team from Concord-Carlisle clinched the victory with 7 free throws in the final minute of the game. Poor said that his past experience helped him be prepared for the packed gym, which allowed him and his teammates to pull away from the Panthers at the end of the game. Concord-Carlisle advances to the MIAA Division 2 Central Sectional semifinals, where The Patriots will play top-seeded Nashoba at WPI on Tuesday at 7:30 PM. Looking ahead, Coach Cohen said that he’d like to see his team avoid lapses on defense and move the ball more on offense. Tuesday’s semifinal showdown between Concord-Carlisle and Nashoba will feature two different types of teams. Concord-Carlisle has scored at least 60 points 18 of their 21 games this season, and have players such as Mulligan and Poor that have proven their ability to put up 30 points in one night. On the other side, Nashoba is one of the best defensive teams in the state. This season, they held Marlborough to 2 points in one quarter and Groton-Dunstable to 3 points in one quarter. The Chieftains are coming off a quarterfinal game in which they held Milford to just 24 points in 32 minutes. Concord-Carlisle is riding an 11-game winning streak, while Nashoba had an early exit from the Clark Tournament, which capped off their regular season. On Tuesday night, we will see if the senior-laden Patriots can put up enough points to fight past Nashoba’s tough defense and balanced offensive attack.